Music is a Powerful Communicator. So here I am in New York, and this morning had to decide how I was going to travel uptown. I was born and raised in this city, and have been riding subways since I was a child…but not today. As I was heading toward the subway station I began to think about recent events in London, and suddenly I was hailing a taxi cab. Tomorrow I’ll probably take the subway, ’cause I felt rather silly not doing so today, but in a way I was glad for the reminder because it is so easy to go about one’s business without thinking about the horrors taking place in other countries. Thinking about all the people dying, and recalling the days and weeks following 9/11, made me think of Taps. 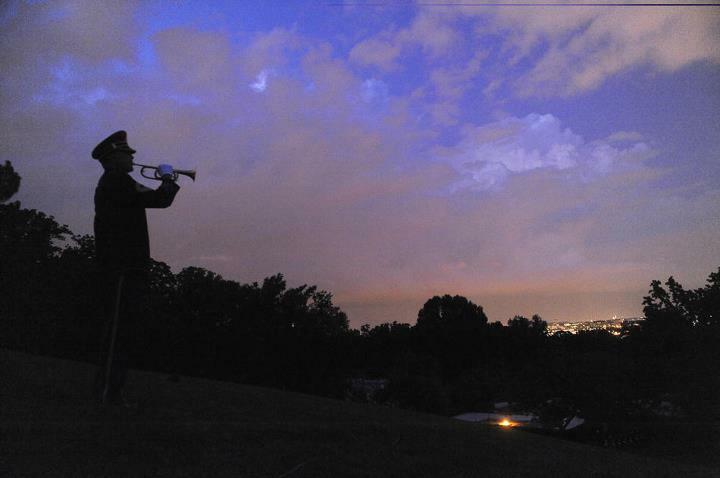 It is perhaps the most famous of all bugle calls, and is comprised of just 24 notes. I don’t know for sure when I first heard that haunting melody. I keep thinking that it was probably at summer camp signaling ‘lights out’ – the original purpose of the call – or perhaps in an old war movie soundtrack, playing as darkness enveloped the barracks of the good guys. Fond memories aside, my first exposure was most likely while watching television coverage of John F. Kennedy’s funeral – I was barely eight years old. Over the last forty years, the American public has come to know Taps all too well. For many days following 9/11 we heard it several times a day, and now as soldiers and civilians in all corners of the world die at terrorist hands in political and religious wars, I only hope that we never become inured to the sadness that Taps evokes. Other stories of Taps’ origin include a Union Army father finding the musical notes on a slip of paper in the pocket of a dead Confederate soldier…his own son. Villanueva has traced this tall tale back to a Ripley’s “Believe It Or Not” story that was later spread by re-telling in an Ann Landers or Dear Abby column. Her byline has been seen in national magazines and newspapers, and she has written more than a dozen books. Also a technology expert, Hall was the Director of Corporate Communications for a software company, and freelanced as a skilled developmental and technical editor for Microsoft Press and others. With an additional background in music, entertainment and public relations, she is sought after as a writer of press releases, executive and artist profiles, and liner notes for recorded music. This entry was posted on Friday, May 25th, 2018 at 6:04 am	and is filed under Bugle Stories, Bugles for Performing and Collecting, General Interest, History of Taps. You can follow any responses to this entry through the RSS 2.0 feed. You can leave a response, or trackback from your own site.